Now What? : Pie, Oh My! Last I wrote, I told you I was going off to do one of the things on my 43 things list. Well I’m back. 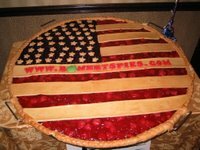 I went and entered one of my pies in a pie contest. Now I knew I was a long shot. Many of the pie entrants were old timers. Most were from the south, which in my opinion is the pie Mecca of the United States. I also knew that many of the competitors were fierce and serious about pie. Many would be entering 14 pies. Still, I wanted to try it and say that I did it once. If anything, I just wanted to have fun and get me some pie at the pie buffet. So I packed my things up and hubby came along as my cheerleader. Knowing that the TSA can be suspicious of nail clippers and breast milk, I knew that my jar of tapioca and whisk would probably cause all sorts of trouble at JFK. I mean, I highly doubt there has ever been a death by sifting incident but I’m not taking any chances. So I cautiously wrapped and labeled everything with an explanation of the contents. I wrote my name, my flight and cell phone number and included a list of items that were in my bag and placed it inside my luggage. Since we dropped our pooches at doggie day care we decided to long term park our car so we could pick them up immediately after arriving home on Sunday. So we drove our car to the airport and while hubby went to long term parking, I went to check in. This is the first sign that things weren’t going to be as cut and dry as I had hoped. When I got the electronic check in, I kept receiving an error. I finally went to the electronic check in help desk and a Hispanic lady who was responsible for checking in the electronic check in luggage tells me that my flights were reversed. My itinerary shows I’m departing from Orlando today and returning to Orlando on Sunday! pg: Let me get this straight. I’m a bit frazzled so please mind me but in addition to the $400+ I paid for my ticket, I’m supposed to pay an additional $400+? airline representative: Ma’am all I can say is that I can bill your credit card $400+ today if you give me a verbal yes. I hung up desperate. The first thing that came across my mind was, is this really worth it? Maybe I should take my losses and just go home. The second thing was, how the hell am I supposed to tell my husband that I totally brain farted and booked the flights in reverse? Ladies and Gentlemen, my husband up until the moment he reads this had no idea of this commotion regarding our airline tickets. Honey, if you ever read this, I hope you don’t use this in my senility hearing. I suppose I looked totally out of it because a kind Asian attendant told me to come over to her and asked what the problem was. I explained my dilemma and she patiently and calmly straightened everything out for me. This woman was the nicest and sweetest person and I thank her wholeheartedly for helping me. She even gave me her email address and told me to email her the results of the contest. I’m not going to tell you that the airline I flew at is my first choice in airlines. In fact, my first choice without a doubt is Jet Blue. The staff is courtesy and helpful and I have never had any problems with tickets, luggage, check in or any other airport rigmarole. I won’t name the airline that we flew but you may recognize them by the end of this story. Grace, if you ever change airlines, they would certainly lose one of their best representatives. pg: I don’t know. Long term parking. Where is it? L: Howard Beach. It’s all the way at Howard Beach! I had to take the monorail and I swear there was only one in service and you have to go through every terminal stop to get here. Howard Beach was the last stop so I hit every station! I tell him that because the policy has been changed to 1 hour check in which is true we were bumped to the next flight. We go hunt for lunch. Now, surprisingly, JFK does not have a huge selection of cuisine. In fact, the only thing you really have is Wok and Roll and Burger King. So we had Burger King. I haven’t had a Burger King sandwich in years. In fact, I thought Burger King all but left NYC. We spent the rest of the time waiting at the local bar. Thus began the trip where an alcoholic beverage was Pantrygirl’s best friend. From Thursday ‘til Sunday, there wasn’t a time where an alcoholic beverage was not the beverage of choice for pg. Our flight was delayed by 20 minutes but we finally made it on board. I was about to nap and enjoy my iPod’s shuffle feature when Lrudlrick and I endured the most painful and embarrassing preflight safety instruction ever. Now I’ve been on planes were the newbies are giving the safety instructions. I’ve cheered them on and even given them a round of applause for their efforts. This was just absolutely horrible. Instead of a live demo, this airline had a taped recording of a character actor stating the instructions to cheesy salsa musak. Yes, that’s musak not music. In addition, the character actor had the worst Hispanic accent known to man. My husband turned to me and said, if I was Hispanic, which I am, I’d be really insulted, which I sort of am. It was so horrible I was waiting for the attendants to dance down the aisles with straw hats and maracas. I wanted to video tape it for you to hear but figured with the grater and the sifter in my luggage, I really didn’t need to start more trouble. To make it worse, on their in-flight music channel, they start it off with an image of their plane bumping like a low rider. I tried video taping that for you but with the turbulence and the sound missing, you really can’t get the full effect. A few drinks later and we arrived and went to pick up my checked in luggage. While Lrudlrick picked up our rental car, I went through the luggage and found that the TSA indeed went through my luggage. They left a nifty card saying they went through my things like a three little bear. I also noticed that they opened my spices to inspect it. I guess Tapioca, cinnamon and salt could look like something else. For the rest of the day we went to dinner, drank and went to Winn Dixie where I bought my supplies and pre-made my dough and chilled it. Parent-proofing a PC. An appeal for help. Pinball Song . June Pointer, R.I.P. 5 Night Stands. 1 Night Stand. How hard is it to give you my money? Who's 'The Man'? Really? Are you serious? The one about my fear of chainsaws in the shower.